Egypt and Israel Caught in an Al-Qaeda Whirlpool? A clear strategic context explains the recent flare-up between Israel and the Palestinian extremist organizations in the Gaza Strip, which was sparked by the armed incursion into Israel, across the Egyptian border, of more than twenty Palestinian terrorists from the Popular Resistance Committees. This assault, which left eight Israelis dead, set off the latest round of fighting in southern Israel. It would not have been possible without the growing weakness of the Egyptian regime’s grip on Egypt as a whole and the Sinai Peninsula in particular, especially since the collapse of the police state maintained by ousted president Hosni Mubarak. Israeli spokesmen as well as politicians repeatedly stressed the fact that Egypt had almost lost control in Sinai. Israelis noted that Egypt’s gas pipeline to Israel, Jordan, and Lebanon had been sabotaged five times since the inception of the post-Mubarak military regime. Israel also issued warnings to its citizens not to stay in Sinai since it had become a haven for terrorists, smugglers, and arms trafficking. Intelligence sources said there were about ten thousand Muslim extremists in Sinai, training and getting logistical support from local Bedouins. Oddly enough, the Egyptians were ready to admit privately their own limitations in halting the massive smuggling from Sinai into Gaza. According to Wikileaks documents, it was the same Field Marshal Tantawi, today head of the Supreme Military Council and then defense minister under Mubarak, who negotiated with the U.S. administration ways to prevent the influx of weapons from Egypt to Gaza. At that time the Egyptians were contemplating building a steel wall to seal the border with Gaza hermetically (on April 12 the Egyptian daily Al-Masry Al-Youm reported that Egypt had ceased building this wall). Tantawi was also considering an American suggestion to use new technologies meant to destroy underground tunnels, which were used to channel the weapons into Gaza. The same intelligence sources reported that since Mubarak’s resignation and a more sympathetic Egyptian policy toward the Palestinian cause coupled with a tougher approach to Israel, thousands of rockets along with ammunition and equipment had been smuggled into Gaza from Egypt. Israel was no longer in control of the border. The weapons were transported by Palestinian activists assisted by Bedouins living in Sinai, sometimes with the tacit acquiescence of the Egyptian authorities in the areas and usually without Egypt’s prior knowledge. To stop the loosening of the Egyptian grip on Sinai, Israel agreed twice to significant Egyptian troop increases to their force deployment in the peninsula, thus changing the parameters set in the military annex of the Israeli-Egyptian Peace Treaty. The latest deployment of more than a thousand troops was made only a few days before the terrorist incursion into Israel and was meant to boost Egypt’s efforts to regain its hold on Sinai. Assessing that the main threat to Egypt’s authority was in northern Sinai, where the gas pipeline splits toward the neighboring countries, Egypt decided to deploy its forces in that area, thus leaving the southern part diluted of forces and open to infiltrations. However, from day one of the operations against the extremist organizations in northern Sinai, the Egyptian authorities realized to their dismay that the phenomenon is not limited to Sinai but engulfs the whole of Egypt. Islamist cells have been created all over Egypt so as to topple the regime by force. The network of Palestinian organizations in Gaza has already proved to be a threat to Egypt itself. In January 2011 Egypt’s former interior minister, Habib el-Adly, charged that the Gaza-based Palestinian Islamist group Jaish al-Islam was responsible for a New Year’s Eve attack on a Coptic church in Alexandria that left twenty-three Egyptian Christians dead. Jaish al-Islam is an Al-Qaeda affiliate and was formed by members of the Popular Resistance Committees, the organization responsible for last week’s attack within Israel. The members of the group were part of a Takfiri organization, that is, the same organization of Muslim zealots that assassinated President Sadat in 1981, some of whom subsequently joined the Al-Qaeda militants. The group was trained militarily in Gaza and in the region of Jabal Hilal in central Sinai, which is now the area where most of the fundamentalists fleeing the Egyptian security forces have found refuge. Jabal Hilal has been a notorious base for Al-Qaeda in the recent past and the location of difficult battles between Al-Qaeda and the Egyptian army, in which, in one case, an Egyptian general was killed. Those militants were part of the groups that sabotaged the gas pipeline to Israel. The leader of the Palestinians who allied with the Egyptian members of the El-Arish group was a member of Islamic Jihad in Gaza. He managed to reach El-Arish by using one of the underground tunnels. He had been in prison in Egypt but was able to escape to Gaza in the wake of the Egyptian revolution. The Egyptians associated with the Palestinians were highly educated (one a mechanical engineer, another with a BA in administration) and came from Suez, Alexandria, Qalyoubiah, and Suhaj. The Egyptian security forces were surprised, since this was the first time a Sinai terrorist cell included members from outside of Sinai. The interrogations revealed that there was a Takfiri presence almost throughout Egypt. El-Arish was a convenient location because it is close to Gaza and Israel, making it easier to obtain weapons. The group clearly had a theological, jihadist outlook. Basically they wanted to replace the regime by force according to the tenets of Takfir (in which one Muslim declares another an unbeliever) and of the Egyptian Salafist movement. Most of the Egyptian detainees had been members of fundamentalist organizations for years. Their main targets were Egyptian security forces (which they viewed as heretic) and strategic installations such as the gas pipeline. The process had begun in the aftermath of Mubarak’s fall with the elimination, in response to popular demand, of the entire repressive apparatus. Egypt’s removal of the police state and subsequent political reforms have made it difficult to maintain domestic security and keep militants under control. Indeed, militants are already taking advantage of the political openness. Moreover, the shakiness of the regime (Egypt has had three cabinet reshuffles since the revolution), which has been more permissive toward criticism of Israel and lax toward anti-Israeli demonstrations, has fostered an environment in which opposition groups feel encouraged not only to attack the regime and demand more freedom, but believe they can maneuver the regime into a hostile stance toward Israel. Just as the political groups are “asking for the heads” of the former regime, the most extreme of them advocate a radical posture toward Israel that entails declaring the peace treaty null and void. The new era of openness has allowed Islamist actors to emerge as legitimate political entities. The rise of various Islamist factions (the Muslim Brotherhood, Salafists, Sufists, and others) that are striving for power makes it difficult for jihadists to directly threaten the regime’s stability. Realizing that they cannot (despite the broader Arab unrest) confront the Egyptian state head-on, the jihadists are trying to undermine the regime indirectly by exploiting the situation regarding Gaza and Israel and through renewed militancy in Sinai, and also by reviving religious tensions between Copts and Muslims, which reached an unprecedented level in the months after the revolution including the burning of churches, attacks on individuals, and so on. Field Marshal Tantawi is under much stress both on the domestic and regional levels. Egypt is in the early stages of trying to manage both political and militant opposition in a tense climate, and it is unable to maintain internal security as effectively as it once did. Nevertheless, it seems the regime is realizing that the political openness is not so much to its advantage but rather to its detriment. That is why Tantawi decided to announce only in September the schedule for the constitutional reform, and also to take a tougher hand against demonstrators in Tahrir Square and Alexandria. Particularly significant is that the cell captured in El-Arish shows that the Takfiri and jihadist movement in Egypt is very much alive and even gaining more terrain. It can be assessed that the Takfiri militants are either part of Al-Qaeda or working hand in hand with their Al-Qaeda operators. Indeed, for decades Al-Qaeda leader Ayman al-Zawahiri has wanted to undermine his home country, Egypt, and the Arab unrest now offers an opportunity. His rise to the top of the jihadist hierarchy could also herald an increasing role for Egyptians within the global jihadist network, which would make it easier for Egyptian Takfiri militants to work with Al-Qaeda. The result is that Al-Qaeda can be expected to make its presence felt in the Egyptian-Gazan-Israeli border area. If so, it will not only complicate matters for Israel and its efforts to deal with Gaza, but could seriously damage the Egyptian-Israeli relationship that has existed since the 1978 Camp David Accords. Only a tight, effective, but mostly tacit partnership between Israel and Egypt can help both parties, each for its own reasons, cooperate in eradicating the fundamentalist cells in Sinai and beyond. According to unconfirmed reports March 31 from a STRATFOR source linked to Palestinian Islamic Jihad, seven Estonians kidnapped March 23 in the Bekaa Valley are in Syria. The Syrians suspected the foreigners because they were in Syria during protests, traveling to places rarely visited by tourists, and because they were riding bicycles, which allowed them to explore Syrian installations and side roads. Syrian officials did not want to apprehend the Estonians in Syria, so they asked them about their next destination and waited for them there. Local Syrian agents, most likely members of the Popular Front for the Liberation of Palestine-General Command, kidnapped them and brought them back to Syria for questioning. The Estonians will soon be returned to Lebanon and released from there, the source said. Said Khatib/Agence France-Presse — Getty Images The wreckage of a motorcycle hit by an Israeli rocket in the southern city of Rafah. Two militants were wounded; one died. GAZA — A Palestinian human rights group in Gaza took the unusual step this week of condemning the building and storage of anti-Israel rockets in densely populated areas, a practice that has led to injuries and deaths of civilians. The Palestinian Center for Human Rights said that it had investigated recent rocket explosions and found that locally produced projectiles had fallen on homes in Gaza or exploded in factories where they were made or stored. Shrapnel severely wounded several people, including a 22-year-old woman and her 7-month-old baby. “This poses a major threat to the lives of the Palestinian civilians,” it said. Israel has long accused Hamas and other groups of endangering Palestinian civilians by carrying out militant activities in densely populated areas. Hamdi Shaqura of the rights center said conducting such investigations was risky in Gaza. Militant groups generally deny responsibility. He noted that the Hamas Interior Ministry Web site blamed Israel for the landing of what were locally produced rockets on Palestinian targets. On Wednesday, a Palestinian militant was killed in an Israeli airstrike in Gaza, days after armed groups here announced a commitment to an unofficial cease-fire with Israel. A rocket fired from a drone hit two militants on a motorbike in the southern city of Rafah, wounding them both, and one later died in the Rafah hospital, doctors there said. The two were members of Islamic Jihad’s armed wing, which has fired dozens of mortar shells and missiles at Israel recently. The Israeli military said they were part of a squad that launched rockets at southern Israel a day earlier. Also Wednesday, Hamas police officers broke up a small demonstration by youths calling for an end to the split between Gaza and the West Bank, where the Palestinian Authority holds sway. Recent efforts by the authority to reconcile with Hamas have so far led nowhere. Fares Akram reported from Gaza, and Ethan Bronner from Jerusalem. What the Palestinian silence on who committed what atrocity tells us is that in this new terror war, Palestinians believe they can’t lose. What are we to make of the fact that no one has taken credit for Wednesday’s bombing in Jerusalem? Wednesday’s bombing was not a stand-alone event. It was part and parcel of the new Palestinian terror war that is just coming into view. As Israel considers how to contend with the emerging onslaught, it is important to notice how it differs from its predecessors. On a military level, the tactics the Palestinians have so far adopted are an interesting blend of state-of-the-art missile attacks with old-fashioned knife and bomb-in-the-briefcase attacks. The diverse tactics demonstrate that this war is a combination of Iranian-proxy war and local terror pick-up cells. The attacks are also notable for their geographic dispersion and for the absence thus far of suicide attacks. For the public, the new tactics are not interesting and the message they send is nothing new. 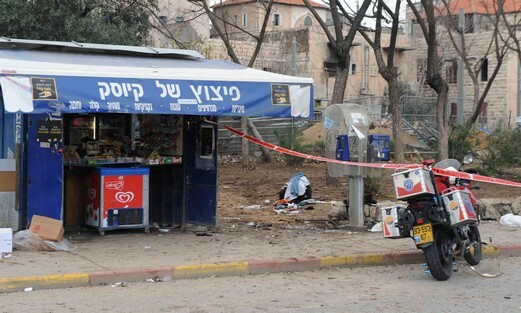 With or without suicide bombers, Israelis understand that we are entering a new period of unremitting fear, where we understand that we are in danger no matter where we are. Whether we’re in bed asleep, or our way to work or school, or sitting down on a park bench or at a restaurant, whether we’re in Rishon Lezion, Sderot, Jerusalem, Itamar or Beersheba, we are in the Palestinians’ crosshairs. All of us are “settlers.” All of us are in danger. The military innovations are important for IDF commanders who need to figure out how to answer the public’s demand for security. They will have to draw operational conclusions about the challenges this mix of tactics and strategic architecture poses. While the military rationales of the various Palestinian terrorists are important, like its two predecessors, the new Palestinian terror war is first and foremost a political war. Like its two predecessors, which began in 1987 and 2000, the new terror war’s primary purpose is not to murder Jews. Killing is just an added perk. The new war’s primary purpose is to weaken Israel politically in order to bring about its eventual collapse. And it is in this political context that the various terror armies’ refusal to take responsibility for Wednesday’s attack in Jerusalem, and their moves to shroud in ambiguity much of the responsibility for their recent terror activity is noteworthy. In the past, Fatah, Hamas and Islamic Jihad were quick to take credit for massacres. Initially it seemed as though that standard practice was being continued in the newest round of murder. Fatah’s Aksa Martyrs Brigades, for instance, were quick to take credit for the massacre of the Fogel family in Itamar on March 12. Hamas seemed to be competing for credit when its forces held a public celebration of the atrocity in Gaza City on March 13. But then Fatah withdrew its claim of responsibility, and Hamas never claimed credit. As for the rocket and missile barrages from Gaza, Hamas took credit for the 58 projectiles shot off on southern Israel last Saturday. But then it let Islamic Jihad take credit for the longer-range Katyusha attacks on Rishon Lezion, Beersheba, Gedera and Ashdod this week. In the two previous terror wars, the terror groups had two motivations for taking credit for their attacks. The first reason was to expand their popularity. In Palestinian society, the more Jews you kill, the more popular you are. The main reason Hamas won the 2006 Palestinian elections was that the Palestinians believed Hamas terror was responsible for Israel’s withdrawal from Gaza in August 2005. Even though Fatah actually killed more Jews than Hamas did between 2000 and 2005, Hamas reaped greater rewards for its attacks because its record was unblemished by political engagement with Israel. The second reason the various groups have always been quick to take credit for attacks is that they wanted to show their state sponsors that they were putting their arms, training and financial support to good use. Saddam Hussein and the Saudi royals paid handsome rewards to the families of killed and captured terrorists. Over the past several decades, Iran, Syria and Hezbollah have spent hundreds of millions of dollars arming, training and financing Palestinian terror cells from Fatah, Hamas and Islamic Jihad alike. The fact that today neither Hamas nor Fatah is interested in taking credit for Wednesday’s bombing in Jerusalem or for the massacre of the Fogel family is a signal that something fundamental is changing in the political dynamic between the two factions. Before considering what the change may be, a word of explanation about Islamic Jihad is in order. Islamic Jihad was founded by Iran in 1988. Unlike Hamas and Fatah, Islamic Jihad has no political aspirations. It has no political operatives, and it is content to limit its operations to terrorism. After the much larger and more powerful Hamas subordinated its command and control to Iran in 2005, Islamic Jihad has served as nothing more than a Hamas sub-contractor. It carries out and takes credit for attacks when Hamas doesn’t wish to do so. There are two plausible internal Palestinian explanations for Fatah’s and Hamas’s newfound reticence, and they are not mutually exclusive. The first explanation of their silence is that the recent talk about Fatah and Hamas forming a unity government is serious. Fatah’s announcement Thursday that it had arrested two Islamic Jihad terrorists in connection with the Jerusalem bombing is notable in this vein. It signals that after four years of fighting Hamas forces in Judea and Samaria, Fatah is looking for a more politically convenient group of usual suspects. The second reason Hamas and Fatah may be keeping mum about who is responsible is that they both know who did it and they are using the terror to gain leverage against one another at the negotiating table. If Hamas is carrying out the attacks, its leaders may simply be using them to strengthen their bargaining position in the unity talks. Fatah knows that if Hamas takes credit for the attacks, its mass popularity in Judea and Samaria will grow. And if Fatah is carrying them out, its leaders may be using them to show Hamas that they are serious about burying the hatchet with the Palestinian branch of the Muslim Brotherhood. WHILE THE internal political dynamics of the various Palestinian terror groups is interesting, it is not the main game in town. For both Fatah and Hamas, the most important target audience is Europe. But before we discuss how the Palestinians’ assessment of Europe is connected to their move to obfuscate organizational responsibility for terrorism, it is necessary to consider the concrete political goal of their new terror war. Fatah is in the midst of a global campaign to build international support for a unilateral Palestinian declaration of independence in September. From Israel’s perspective, the campaign is threatening for two reasons. First, a unilaterally declared Palestinian state will be in a de facto state of war with Israel. Second, if the Palestinians secure international recognition for their “state” in Jerusalem, Judea, Samaria and Gaza, the move will place 500,000 Jews who live in these areas in the international crosshairs. Much of the discussion about this goal has centered on whether or not US President Barack Obama will veto a UN Security Council resolution endorsing such a declaration. And based on Obama’s behavior to date, the Palestinians have good reason to believe that he may support their move. But in truth, the discussion about how the US will respond to the planned Palestinian declaration is largely beside the point. The point of the threatened declaration is not to get a UN Security Council resolution supporting it. The point is to get the EU to enact further sanctions against Israel. The Palestinians assess that Europe is swiftly moving toward the point where it no longer needs to pretend to be fair to Israel. The British, French and German votes in favor of the Palestinians’ anti-Israel Security Council resolution last month were the latest sign that the key European governments have adopted openly hostile policies toward Israel. More importantly, these policies are not the consequence of Palestinian lobbying efforts, and so Israel cannot hope to change them through counter-lobbying efforts. Europe’s abandonment of even the guise of fairness toward Israel is the product of domestic political realities in Europe itself. Between the rapidly expanding political power of Europe’s Muslim communities and the virulently anti-Israel positions nearly universally adopted by the European media, European governments are compelled to adopt ever more hostile positions toward Israel to appease their Israel-hating publics and Muslim communities. Take British Prime Minister David Cameron, for example. When Cameron called Gaza “an open air prison” last year, it wasn’t because he had just spoken to Fatah leader Mahmoud Abbas. And he certainly wasn’t acting out of conviction. Cameron surely knew that his statement was an utter lie. And he also surely knew that Hamas is a jihadist terror group that shares the ideology of its fellow Muslim Brotherhood spin-off al- Qaida. But for Cameron, far more important than Gaza’s relative prosperity and Hamas’s genocidal goals was the fact that in the last British elections, the UK’s Muslim Public Affairs Committee (MPAC-UK) successfully ousted six members of parliament who expressed support for Israel. The Palestinians recognize that they don’t need to pretend to be good to get Europe to support them. After the people of Europe have been brainwashed by their media and intimidated by the Muslim communities, they have developed a Pavlovian response regarding Israel whereby every mention of Israel makes them hate it more. It doesn’t matter if the story is about the massacre of Israeli children or the bombing of synagogues and nursery schools. They know that Israel is the guilty party and expect the governments to punish it. What the Palestinian silence on who committed what atrocity tells us is that in this new terror war, the Palestinians believe they cannot lose. With Europe in tow, Fatah and Hamas feel free to join their forces and advance both militarily and politically. Palestinian factions met March 26 in the Gaza Strip to discuss renewing a truce with Israel after a week of attacks, AFP reported. Hamas leader Ismail Haniyeh said that he has been making contacts with other factions in order to avoid new confrontations with Israel. Haniyeh said specifically that he had spoken with Ramadan Shallah, the Damascus-based chief of Palestinian Islamic Jihad, the group that has claimed responsibility for many of the hundreds of projectiles fired on Israel in the past week. A Hamas spokesman said that Hamas is set on protecting stability.